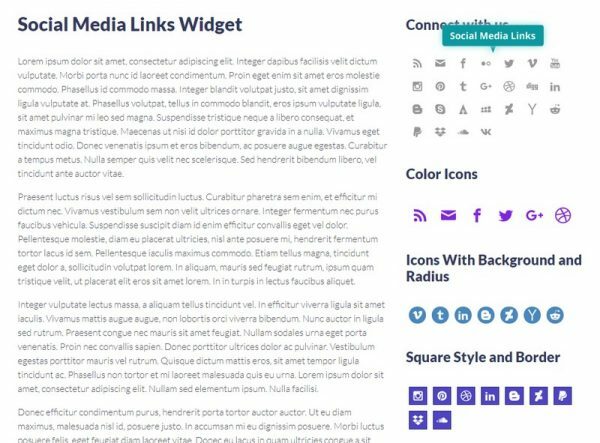 This widget has a big pack of predefined social media icons - up to 25 social media icons + 5 custom fields where you can pick additional icons as you need. It has great settings of the icon colors, sizes, backgrounds, borders and much more. The widget supports up to 25 predefined icons + 5 custom (Font Awesome) icons which you can add to a single widget. In the predefined fields, please always insert a full URL to your social profile/website page, e.g. https://facebook.com/username. To add a new custom icon with a link, please click on the Add item button to create a new icon. A few icon options will appear, like field to insert the Font Awesome icon, link URL and icon title used for the tooltip. Once you set all the fields, just click the Save button to finish the process.